← New Impression Obsession Challenge – New Beginnings! Impression Obsession Spring Release Celebration! The Impression Obsession Spring Release Celebration starts today and goes all week long (January 7th-11th). Every day you can find a list of participants on the Impression Obsession Blog at 6am ET. 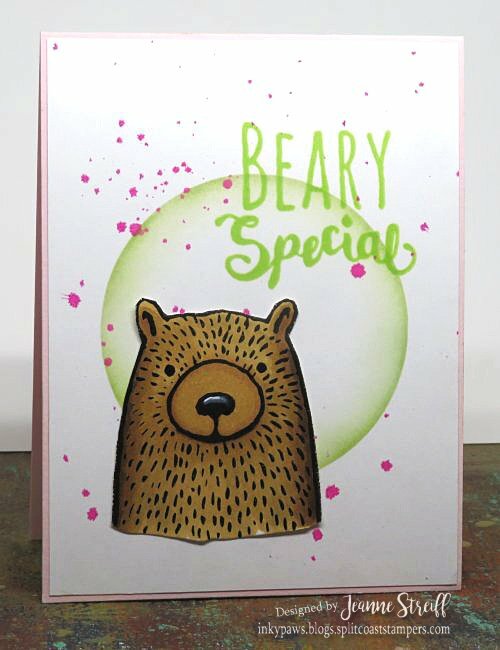 My first card uses D15152 Big Bear and C15151 Beary Special. The background was made using a stencil (Marvelous Masks Circles) and some ink splatters. This entry was posted in All Occasion, Easter, Impression Obsession, IO Inks, MISTI Tool. Bookmark the permalink. Bunny Love fun … adorable. I like the simplicity of your cards. You have a good sense of design. OMG, the Bunny Love stamp is so cute!!!! Love the edging you did on the bunny love card. At first I thought it was a really thin mat!! Thanks for the smiles and giggles! These are both so very cute and just lovely. 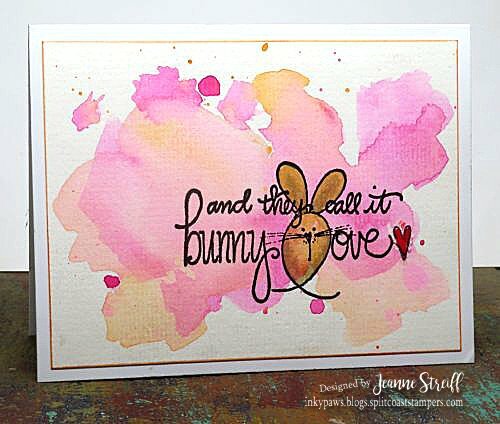 Beautiful watercolor background on your 2nd card, and I especially love the Bunny Love stamp! *swoon* I love that bear face -then I saw the bunny love!♥ The gorgeous backgrounds you created really let the stamp image and sentiment take centre stage. So much fun seeing all the new spring images!!! That bear is so cute!!!! I love your background and the “splatter” Great job! How lovely! Bunny is so cute! Love both of your cards, they are just so sweet! Love the bunny love card. Both cards are wonderful, as always! Thanks for sharing! 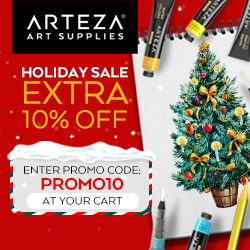 These critters are so cute–great card designs. Darling cards! Love the bear and the bunny! That bear again is so cute!! And I’m loving the bunny image with the watercoloring all over it!! LOVE how you colored your bear. He is so adorable! The watercolor splotches look great. Very artsy. Love these CAS cards. The watercolor splotches really add the wow factor. I love the humor of the bunny love stamp. The water colored background is perfect and the colors make me long for spring. Adorable cards! Love the bunny! I’m in love with that bear and love the clever bunny in the sentiment! Love that bunny card. So cute. Fun cards and great way to do the BG! 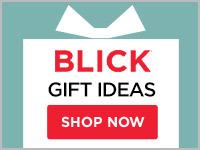 Love the simplicity of your cards, such a cute image to play with!!! Both cards are so adorable. Such adorable cards. Makes me want to play with my watercolors! So different, love the bunny! Goodness, Jeanne. Both are so cute! That bear though, here’s a must have! Wonderfully sweet cards! Fabulously creative and clean designs.